Cleaning kitchen cabinets does not have to be a laborious chore when you do it often. Kitchen cabinets get a lot of use and seem to catch grease with dust sticking to the grease, food particles on your hands, and dirt from just being opened and closed. Drawers holding utensils and other items will have their font panels dirty too along with the insides. The kitchen is the most used room in the house but doesn’t get cleaned as often as you do laundry, load the dishwasher, and vacuum up pet hair and messes. Always do a test spot in an inconspicuous place on your wood cabinets whether they are solid wood, laminate, or wood veneers. 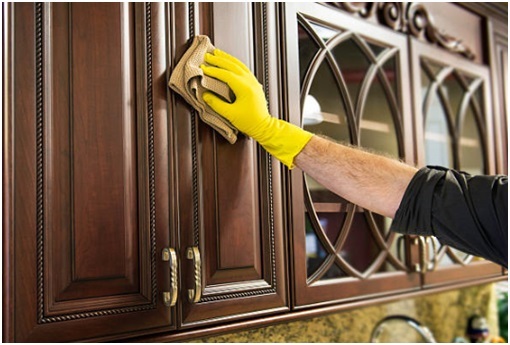 When you are finished, you can polish the wood to have your cabinets look like new. These methods can be used for wood, veneers, laminate, and metal cabinets. Be sure you have good ventilation when using vinegar. 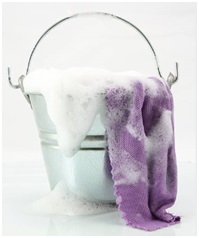 Put 1 cup of liquid dish washing detergent into 2 cups of warm water in a small bucket or container. Stir it to mix. With a clean sponge or soft clean cloth scrub the cabinets making sure you don’t scratch them. If something is stuck and won’t budge, use a small thin paring knife to pry it loose or let it soak about 15-minutes. Rinse with cool water to remove the soap. You might have to do this a few times to get all soap off. Dry with a clean cloth. This method removes grease film and fingerprints. Wipe down the insides of your cabinets and doors with detergent water and let the shelves completely dry. Use distilled clear vinegar made of corn or apple cider dark vinegar. You can use it straight from the bottle or add a cup to a cup of warm water. You can put it in a spray bottle too. Wear rubber gloves to protect your hands. It will remove the sticky residue and leave them clean of any bacteria. This works well for cleaning wood cabinets, stainless steel appliances and porcelain appliances as well. Rinse with clear water and towel dry. 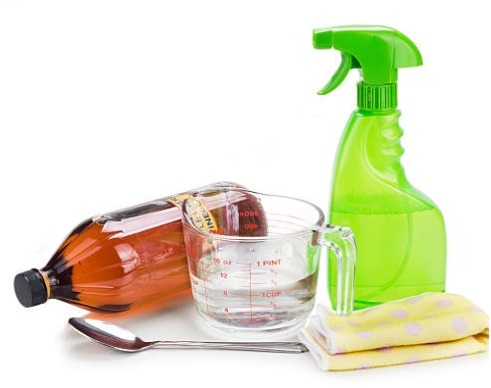 Vinegar is good to clean glass, ceramic, marble, and counter tops too. Baking soda is ideal for tough food buildup or stains. It is slightly abrasive but will not scratch cabinets. 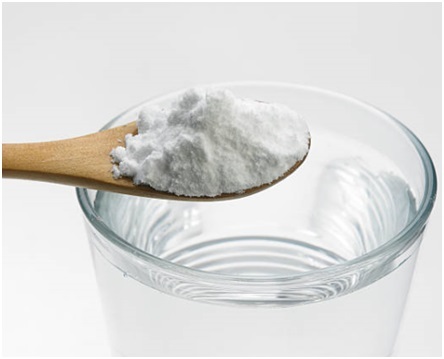 Make a paste of baking soda and water. Rub briskly and rinse with cool water then towel dry. You can always use the detergent and water mixture above to clean off the soda for a nice finish. Polish after the wood is thoroughly dry. Use a polish rather than a wax because wax will have dust build-up in no time. You can buy a polish that has a high shine or low luster. 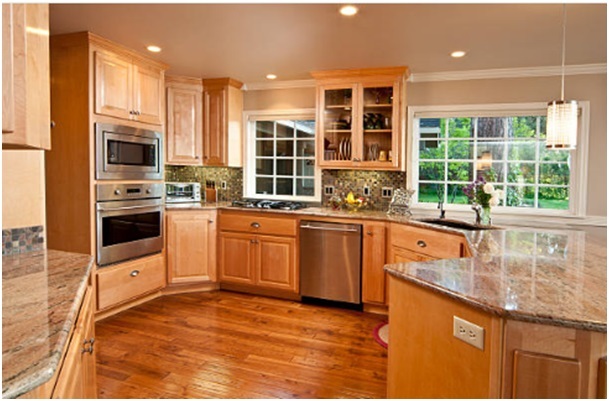 Your wood will be so lustrous and radiant and will look like the day you bought the cabinets. Never put polish over dirty cabinets since you will have a sticky greasy mess that will take forever to remove. Buff to a high polish and you are done. For saving time, give your cabinet doors and frame a weekly spot treatment especially where grimy greasy hands open them on the corners or with the handle. Spray with a multi-purpose cleaner. Deep clean the kitchen cabinets inside a few times each year removing all the contents. It might be a good time to put all the glass items into the dishwasher to refresh if you don’t use them often. I don’t use my pedestal ice cream sundae dishes often, so this is the time I wash them to be sparkling clean minus dust that does get inside cabinets. Dry completely before putting the contents back in. Wipe down grease and fingerprints as soon as you see them with diluted vinegar. The cabinets above the stove will have the most grease because they are directly up from the cooking surface. Don’t let runs of liquids or even water fall down your lower cabinets. It will stain the wood and be hard to remove if it did not become absorbed by the wood’s fibers. If you use a deep fryer on your counter top, they are notorious for splattering grease everywhere. Clean the fryer with glass cleaner on the outside and don’t forget the cord. At the same time, you can clean out the toaster removing the bottom plate holding the crumbs and clean the outside too. Your food processor probably needs to have its base and cord cleaned so use soap and water or glass cleaner not forgetting the cord. At the bottom toe plate, remove the difficult shoe scuffs, chair or table leg scuffs with a soft eraser and wipe it. While you’re at it, remove the plastic or stainless-steel electrical and light switch plates and wash them in the dishwasher on the top shelf. Remove them after the rinse cycle and towel dry. Dishwashers that are set to dry can melt plastic. You can clean the switch with glass cleaner on a cotton swab. Be careful not to touch the wiring or you’ll get a shock. 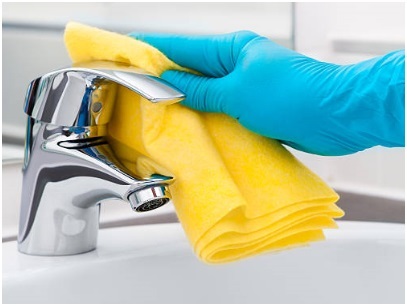 After you have finished cleaning wood cabinets, polish your faucets too using glass cleaner. I do mine each day, so it never gets dirty and only takes a minute. If you have hard water, use straight vinegar from the bottle that will get most off. Put it on a wash cloth and let it soak for hours if necessary. Do not use sharp tools to remove lime scale or mineral build up or the chrome or brass finish will have scratches. When you keep up with wet wiping off ketchup or mustard smears and greasy handprints immediately, your wood or metal cabinets cleaning task will look gorgeous for years to come. Feel welcome to leave a comment or ask a question below and I will reply to each message.